The existence of God cannot be proved in a scientific way by means of observation, experiment or other verification. This type of proof is possible only in the field of physical phenomena. There are two types of evidence, direct and indirect. Indirect proof is based on probabilities and circumstances. Criminals may be convicted on the basis of circumstantial evidence. Only the existence of God can be accepted on this basis or circumstantial evidence coupled with the testimony of saints and prophets. God cannot be known through the five senses. Just as there is the electro-magnetic wave which cannot be seen, heard, tasted or touched yet it carries sound through the ether, in the same way, God’s existence is inferred, though it cannot be demonstrated. You may as well ask the scientist to show you electric energy or magnetism. Moreover, the personal testimony of saints who have realized God is acceptable as is the large percentage of our knowledge which comes to us second-hand. There is little that we know through the direct experience. The existence of the universe and the design or pattern behind it make people feel that it could not “just have happened”, that there is a Great Designer. Just as a big mansion cannot be built without a master-builder or architect, in the same way, the universe must have been created by a Master-Designer who we designate as God. Our awareness of a moral sense within the individual is also a reflection of some moral order in the universe. We know that truth is better than a lie, love better than hate. Where did these beliefs come from? They are an indication of the Creator who requires respect for these values in life. 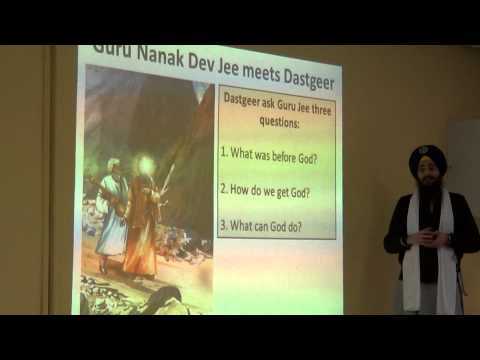 The Sikh Gurus never felt the need to prove the existence of God. They regarded Him as ever-present, not in theory but in fact. Guru Nanak thought Him visible and manifest. Modern scientists and thinkers have come to realize the existence of “A Power” or “the moving hand”, which designs and controls the phenomena of nature. The pattern of the universe and the regularity of the laws behind its working confirm the belief that there is a “Lord of the universe”. « What do we know of God?